PMI Exclusive & Infinia Holistic Pet Foods are now available at Noah’s Pet and Wild Birds, in Fayetteville. The #1 ingredient in Exclusive® Dog and Cat Food is real meat – lamb, chicken, turkey or fish. We’ve also added a carefully-selected balance of fruits, vegetables and wholesome grains in every recipe to support their health – but left out the corn, soy, wheat and artificial flavors & preservatives. 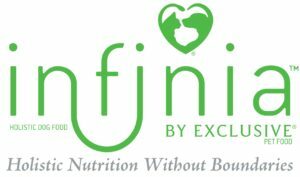 PMI Nutrition is proud to be at the forefront of the holistic dog food movement with Infinia Holistic™ pet food. For pet lovers who only want the best for their companions, Infinia Holistic™ pet food provides a perfect balance of proteins, select carbohydrates, select fats and fruits & vegetables. Read more about it at Infinia Holistic. Join our Frequent Purchase Program! 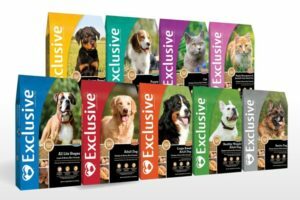 Purchase 8 bags of Purina Exclusive, pet food you’ll receive the next bag FREE! Sign up at Noah’s Pet and Wild Bird Supply in Fayetteville. This entry was posted on Tuesday, July 25th, 2017 at 9:46 pm	and is filed under Cat, Dog, News & Updates, Uncategorized. You can follow any responses to this entry through the RSS 2.0 feed. Both comments and pings are currently closed.